Rattans are important non-wood forest products, naturally growing in a wide-range of habitats in the Indonesian tropical rainforest. Indonesia is the major rattan producing country in the world. A number of artefacts for daily human needs in both rural and urban areas are made from this raw material. Rattan is traded internationally and thus contributes significantly to foreign exchange earnings; it also generates ample labour opportunities for the country' population. A number of studies that have been carried out in the last few decades indicate that rattan grows well in logged-over areas or secondary forests. A sizeable portion of the over 30 million ha of logged-over areas in Indonesia are considered degraded forests. These areas and others in similar conditions elsewhere in the world are suitable for growing rattan artificially. The purpose of this paper is to discuss the present rattan situation in Indonesia and to explore the possibility of sustainable rattan cultivation for future development. Among a few hundreds non-wood forest products of the tropical forest of Indonesia, rattan mainly of the genera Calamus, Korthalsia and Daemonorops are commercially, socially and culturally important. To most low-income rural families, some 51 out of a total of 300 existing Indonesian rattan species are utilised in the making of furniture, tools, and artefacts, and the young shoots of some species being consumed as food. Trade statistics indicate that rattan contributes significantly to foreign exchange earnings. In 1996, about 80 percent of the rattan on the international market originated from Indonesia. Over 90 percent of the production is obtained from the natural forests of the country's three major islands, i.e. Sumatra, Kalimantan and Sulawesi, the remaining 10 percent being mainly small-diameter canes harvested from plantations. It is estimated that about 300 species are found in Indonesia. In terms of diameter, there are two distinct groups of rattan - small diameter and larger diameter. The commercially important small-diameter rattans are mostly found in the swampy areas and lowlands of the archipelago, and constitute the major part of available rattans in their natural habitat. Larger diameter rattans grow mostly in the dry lowlands and at higher elevation over 1000 m above sea level. The latter group can be found as solitary individuals or in clumps. However, 68 percent of the rattan demand from trade and market is directed to larger diameter rattans and 32 percent to small-diameter ones (Gintings et al., 2000). In the past intensive research has been carried out in Indonesia embracing taxonomy, provenance and species trial, propagation, etc. Several attempts have been made by scientific groups, such as research institutes and universities, to introduce rattan inventory models. At best the only applicable method is the combination of cluster sampling techniques and direct observation. The reason for this is simply inventory cost. Aerial photo interpretation is impractical due to the growth characteristics of rattan since it grows both above and under canopies. At present, production fluctuation over a long period of time is the most reliable approximation of production potential. Rattan trade plays an important role in the rural economy, as well as in small and big enterprises. Most raw rattan traded on the market is obtained from natural growth in the primary and secondary forests. 5. trade and economics of rattan. In recent years, the economic crisis has had a negative impact on the poor and already economically marginalized people who live in or near the forest. The era of the growing forest industry in the last two decades has failed to bring prosperity to the people who live in these sensitive areas. The growing number of poor families in the area could have a direct impact on future rattan development. Experience has shown that sustainable forest management (SFM) in Indonesia is much easier said than done. A numbers of initiatives have been taken by international organizations and non-governmental organizations. The initiative to establish SFM in Indonesia was triggered by the International Tropical Timber Organization in 1992 with the establishment of criteria and indicators (C&I). Social and legal aspects are of paramount importance in the success of SFM. Rattan could play a significant role in that endeavour. The distribution of rattans in the world is mostly concentrated in Southeast Asia and, to a lesser extent, in mid-west Africa. It is not surprising that rattans in the above areas are used in the making of household items such as sleeping mats, handicrafts, furniture, etc. In the early 1980s, Indonesia and the International Development Research Centre (IDRC) of Canada established a joint effort on rattan development. A rattan information centre in Kuala Lumpur (Malaysia) was the first of its kind ever established in the world. In 1993, IDRC created the International Network for Bamboo and Rattan (INBAR) aimed at harnessing a research network for both bamboo and rattan. Rattan plants occupy a decisive position in the natural forest of Indonesia. According to best available information (Jasni et al,. in Gintings et al., 2000), 300 rattan species are found in Indonesia. Two genera (Calamus and Daemonorops) have important commercial value. Most species are still not well identified and documented. They have a wide range of distribution stretching from Sumatra Island in the west. They are well distributed in both primary and secondary forests. It is estimated that in the country there are over 3.0 million ha of forests containing rattans, and the annual output is 570,000 t. The highest output reached was in 1980 with 573,000 t. Several species of rattan are now planted. Rattan plantation is encouraged because of its economic value and broad utilization. To most forest dwellers, however, rattan planting is only a secondary crop in addition to the ordinary cash crops in their areas. Rattan collectors, normally work in teams of 5-7 persons. They spend days or even weeks in the forest before bringing back to the market their produce. As the distance to collect naturally grown rattan is increasing, growing rattan near their villages is preferable. 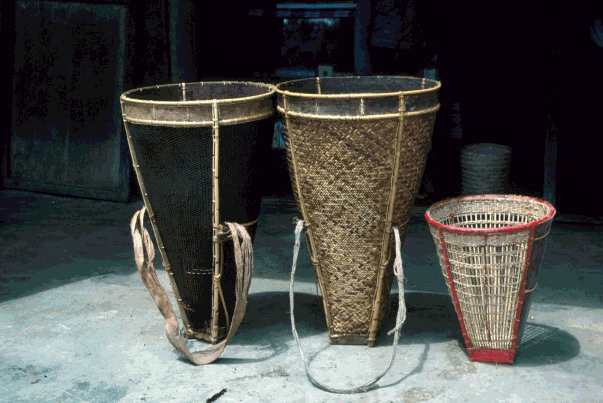 It only takes 5-8 years before-small diameter rattans can be harvested, while it takes 15-25 years for large-diameter rattan, depending on the species. The history of rattan trade and utilization in Indonesia goes back about 100 years. With the development of the rattan industry, many varieties of handicraft, furniture, and household appliance are made with this material for both the domestic and the international markets. Since 1986, the Indonesian Furniture Industry and Handicraft Association reported a continuous development trend of rattan furniture exports. In 1986, the total value of rattan furniture exports (combined with a small portion of wood) reached 112,359 t with a value of US$115.14 million. In 1999, the export volume increased over fivefold to 590,021 t and a value of US$1.147 billion (ASMINDO). It seems that the economic crisis experienced by the country had a positive impact on the rattan trade and industry. The growth of the Indonesian economy in the early 1970s started as a consequence of the acceptance of the foreign investment law in the forestry sector. Investments in the rattan industry were made in the period from late 1970s through to the 1990s. When forest concessionaires embarked on logging the natural forests, they also improved forest accessibility to remote areas and, as a result, rattan production increased sharply. In 1995, there were 548 rattan-based industries throughout the country, an enormous increase from 1988 when there were only 381. During that period, the number of people involved in rattan-related activities (rattan gatherers, farmers, household industries, etc.) more than doubled. It is estimated that over one million Indonesians were involved in such activities, either part-time or full-time. The peak of rattan trade was reported in the period 1994-1997. This was partly due to the conducive investment and trade policies promulgated by the Government. Since then, rattan trade has been declining. Sizeable forest areas containing rattans were converted into other plantations, mostly of oil palm or rubber trees. In the meantime, forest degradation has continued. This is partly due to factors such as malpractice in logging techniques, illegal cutting, forest fires, etc. It is not unwise to state that, if no immediate action is taken, the rattan culture in Indonesia will soon become history. It is also realized that the decline in economic activities of most forest dwellers would result in an acceleration of forest degradation. This phenomenon is already noticeable. Policy-makers should be made aware on this and encouraged to adopt corrective action immediately. Under the pressure of the economic crisis, forest degradation has become more intense and has in fact reached an alarming rate. A number of Government policies and an action plan in an effort to correct this situation were unpopular. An unfavourable economic and political situation has contributed to wider deviation from achieving sustainable forest management in Indonesia. Several conceivable options are available to improve the economic situation of forest dwellers, among others, introduction of medicinal plant cultivation under the forest canopy, cultivation of perennial crops among the forest stands, etc. Such practices could also provide additional value to the forests. From an economic perspective, rattan has a place for development in the already degraded forest for a number of reasons. One important reason is that the rattan chain of activities extends from rural area households to medium trade and industries including international trade. Secondly, rattan with diversified growth characteristics could be propagated in degraded forest conditions. In addition, rattan has a wide range of habitats throughout the country and, therefore, connected activities could be distributed among a wide range of rural poor. If policy-makers fail to take solid action for improving the economy of the rural poor, efforts toward achieving SFM will lead to nowhere. Poverty is the root of forest degradation; therefore, poverty alleviation of those people who live in or near the forests is imperative in order to achieve SFM. The great potential of rattan resources and their role in the livelihood of many Indonesians have attracted the attention of scientists in the last two decades. An integrated study recently carried out included: taxonomy, resources assessment, growth factor requirements, phenology, seed and propagation studies, nursery, harvesting techniques, post-harvest processing, rattan anatomy, workability and engineering, durability and preservation methods, policy studies, trade and cooperatives. Knowledge of the above aspects is available to some extent to support future rattan development. Exchange of views and information-sharing between scientists and rattan-related institutions to ensure significant development in the future is of great importance. Networking on rattan-related subjects, established by INBAR, has demonstrated its great impact on the development of rattan-related activities. Rattan is an important non-wood forest product with inherent capacity for growth. It has long been used for domestic needs as well as an internationally tradable merchandise. As merchandise, it has found its way in international markets and contributes significantly to foreign exchange earnings. Rattan also has an important role to play in supporting the socio-economic conditions of many rural poor whose living solely depends on forests. The poor socio-economic situation of forest dwellers has been identified as the underlying root cause of forest degradation in Indonesia and in many similar parts of the world. Rattan development in such areas is not only economically feasible but also socially acceptable, and environmentally desirable. Research findings are available that could support future rattan development. It is imperative that scientific groups encourage policy-makers to adopt strategic action development plans and to explore further the potential role of these important species. Alrasjid, H., 1999. Teknik Penanaman Rotan. Informasi Teknis Penelitian dan Pengembangan Hutan. Bogor. ASMINDO. 2000. Indonesian Furniture Industry and Handicraft Association. Jakarta. Dransfield, J. et al., 2000. A short guide to rattan. Biotrop ITF/74/128. Bogor, Indonesia. Gintings et. al., 2000. Himpunan Sari Hasil Penelitian Rotan dan Bambu. Pusat Penelitian Hasil Hutan. Bogor. INBAR. 1993. International Network for Bamboo and Rattan. ITTO. 1992. Criteria for the measurement of Sustainable Tropical Forest Management. Policy Development Series. Kalima, T., 1996. Flora Rotan di P Jawa serta Penyebaran dan Populasi Rotan di Tiga Wilayah Kawasan TN Gunung halimun, Jawa Barat. Thesis S2 University of Indonesia. Unpublished. Pusat Penelitian Hasil Hutan. 2000. Sari Hasil Penelitian Rotan dan Bambu. Occasional paper. Bogor. ISBN: 97995743.5.8.